Now that Halloween’s over, it’s officially time to start planning for Thanksgiving, and even start thinking about Christmas, Hanukkah, New Year’s, etc! If you’re hosting guests for Thanksgiving this year, then you’re probably well aware of the fact of just how great open floor plans are – and there’s no time that the conveniences of an open floor plans are more evident than when hosting large groups of people. As you plan for your Thanksgiving dinner or another holiday party, here are some tips on how you can maximize space to entertain your guests. One way that you can maximize space, save time, and make things that much more presentable, is to be sure to get your home and the tables ready in advance. 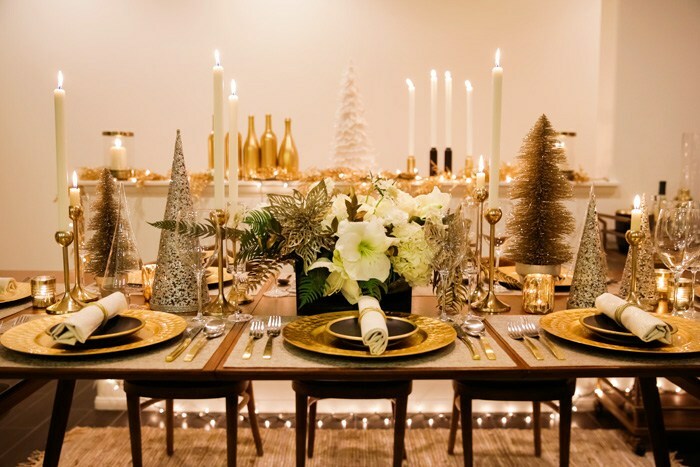 In fact, if you can, you should even consider setting your holiday table days in advance; this will allow you to focus on cooking and hosting day of, and this way you can be sure that things are perfect when your guests arrive. One way to make your space feel larger is to make sure that guests smoothly transition from one part of the night – and one area of the house – to another. If things feel chaotic and people aren’t sure where they’re supposed to be, things can become stressful not only for you but for guests. The best way to plan for this is to know where you want your guests to be and how to get them there. For example, if you want guests to start in the kitchen, place hors-d’oeuvres on the countertop and have a beverage station set up. If you plan for guests to then transition to the dining area, serve food, and make it easy for everyone by having place cards with names at seats. If after-dinner drinks and sweets are to follow in the living room, simply start serving in that area. Finally, if you are living in an older home where you don’t have an open layout, it may be time to consider upgrading to a new home. Open spaces maximize square footage, provide more natural light, foster social cohesiveness, and offer “flex” space that’s flexible based on your needs. At Simplicity Homes, your Northwest home builder, we’ve been building brand new homes on our customers land in communities throughout the Northwest for years. If you’re ready to build on your land, we are ready to help! Building is complex. We make is simple.